Forget the bowl, Joey the cat wants his water straight from a bottle. But we're not talking Poland Spring or Dasani. 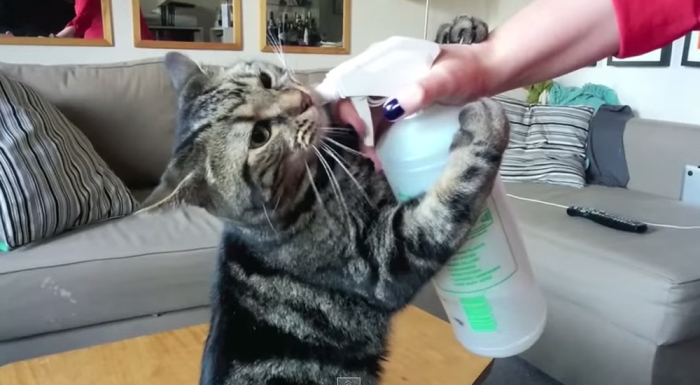 Joey goes nuts over drinking directly from a spray bottle operated by his owner, YouTube user Hilary D.
"He can be completely asleep but the moment you shake it, he's awake and running to you. ... I give him fresh water in a big bowl every day - this is just his favourite way to drink it!" To be honest, if the alternative was drinking from a bowl on the floor with my hair floating in it, I'd probably run for the spray bottle, too. Smart cat.